The Rhodesian Ridgeback is a hound dog breed originating from Africa. They get their name from the length of hair that grows along their spine. Dogs of this breed are descendants of hunting dogs of an ancient tribe native to southwestern Africa named the Khoikhoi. But they also are descendants of other European breeds, including Bloodhounds, Greyhounds, Mastiffs and Great Danes. 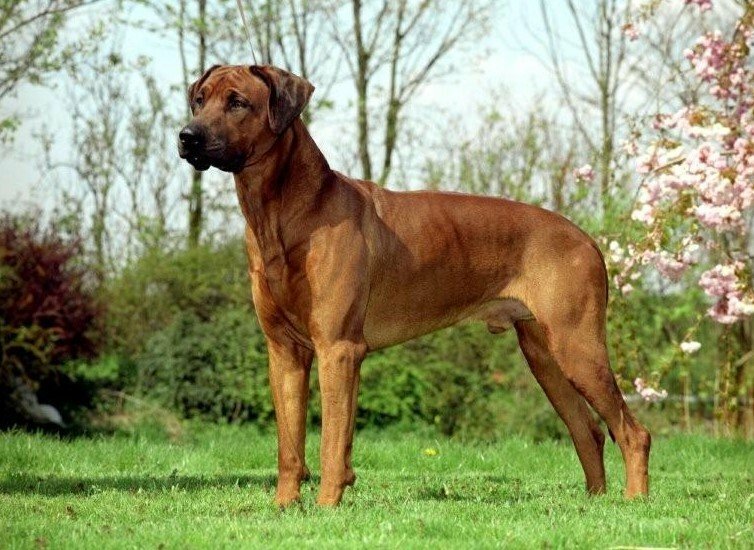 In terms of their core characteristics, the Rhodesian Ridgeback is a jack of all trades. They know how to protect farm animals from predators, defend their owners, and even hunt. This dog breed loves being around their owners, and the fact they get along great with kids makes them an especially good dog breed for families. Not only that, Rhodesian Ridgebacks easily acclimate to being around unfamiliar faces. However, they’re also known for being self-reliant, which can cause them to be stubborn and controlling. It’s natural for them to take charge of situations, and they often try to see what they can get away with, such as lounging around on “forbidden” pieces of living room furniture. For those reasons, people who want to raise a Rhodesian Ridgeback should be stern and uncompromising from the beginning. In terms of temperament, adult dogs of this breed are — for the most part — calm dogs. Puppies are the complete opposite; they’re energetic and can get very rowdy while playing. But, overall, these dogs are truly devoted animals that defend the people they care about, and they’re extremely loving around people they respect. These dogs require a lot of socialization, starting when they’re puppies. Socializing these dogs at an early age can help stave off aggressive behavior later in life. Aggression toward other dogs is mainly a concern for Rhodesian Ridgebacks when they’re around dogs of the same gender. And, although Rhodesian Ridgebacks also get along with most cats if they’re exposed to them at a young age, they can be aggressive toward neighborhood cats who try to access their territory.